You can provide that special friend or family member with many hours of enjoyment throughout the coming year. 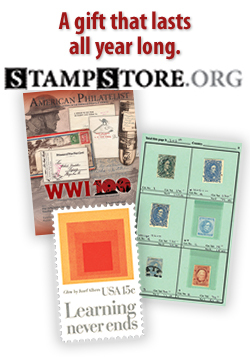 Membership in the American Philatelic Society includes a subscription to our 100-page monthly magazine, The American Philatelist; access to our Internet Sales Unit at www.stampstore.org; availability of mail sales circuits; the best stamp insurance available; specialized library services; outstanding educational programs; and so much more! Our memberships are prorated so that applicants only pay the portion of the year remaining based on the quarter in which they join (our membership year runs from January 1 - December 31). We will send the recipient a gift package containing a letter explaining the gift, a special gift card bearing your name, an application for membership, a brochure explaining all the services and benefits of membership, and a current issue of The American Philatelist, our monthly magazine. Membership will be processed as soon as the recipient completes and returns the membership application. If you are an APS member giving this gift, you also receive a gift! Current APS members receive a $5.00 check every time they are credited with sponsoring the new membership of a fellow collector who joins APS. It's our way of saying "Thank You" for your support of the Society. Have a Question? Contact Judy Johnson for more information.